It's been a while, just been really manic here. Well Skerries and Southern 100 were the main things obviously. Skerries was a wet and wind affair. 400 went well, but the Supertwin races were a case of changing between wet and dry tyres, and usually me ending up with the wrong ones. John was my help for Skerries, and he later claimed that he'd never changed wheels so many times in his life. The second Supertwin race was a washout, and after the sighting lap I decided that as I had The Southern the following week, I'd rather save the bike for then, rather than drop the bike and having a lot of work to do before racing started. The race went ahead but the following Superbike race was cancelled, so felt I made the right decision. Shame as the bike felt good after the work I did over the Winter and looked great with her new fairings painted and fitted. As you can see she's looking good, you can also see how windy it was by our neighbours awning. The more eagle eyed of you can see a new name sticker gracing the screen. Thanks to Shuffy for designing it for me. The 400 went well, but I went out on wets on a dry track. I was later told that you could see her moving around a lot coming out of corners, and I just thought it was me. I went over to The Isle Of Man and had a week 'off', basically it was a week working on bikes, but out of a different garage. This bits a long story, so get a coffee. Earlier in the year I got a given a SV650 after Gordon's son ran it out of oil, he thought it was the cam chains making a noise. So I decided to turn it into a minitwin to use on short circuits to get more track time. Before I went to Skerries I started it up to see how bad the damage was. On tick over she sounded ok, but open the throttle and it was a different story. To replicate the noise, first get a sturdy bag, fill with spanners, then put it in the washing machine, get the idea? So I decided to take the engine in the van over to The Island and strip her down to see what damage had been done. Upon our arrival John and I stripped her down, and was greeted with a mess, but could've been worse and damage was limited to the crank and rods, so project minitwin was go. Southern 100 went well, great organisation and good weather made it a great week. Sadly I blew up the 400 engine in the first race, when a valve broke. Luckily I had a spare 400 engine in the van, as you do, so Steve and I set about swapping the engines over. Engine swap went well but on the first lap the clutch cable came adrift, so that was race two out the window too. 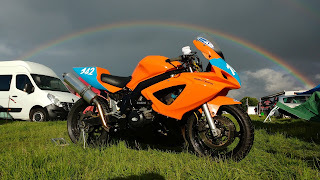 Supertwin went well and had some good races, despite getting a puncture, luckily just as I came back into the paddock. Next up was Killlane, which sadly was cancelled, two days after I booked my ferry, which lost me over £200, but can't be helped. So that was a very short roads season this year, but onwards and upwards and I'm entered to race at Thruxton on 8th October. I haven't raced at a short circuit since 2006, and I last raced at Thruxton in 1996, sure it still goes the same way though, so is going to be a big change for me. The bike though, is looking good, but still loads to do according to by ever present list. Hopefully getting her finished won't mean too many more late nights and I will have a good run round. I'll try not to leave it so long until my next update, and if you are at Thruxton come along and say hello. Good to hear how things are going Stu, we're well overdue a catch up!